The ice-cream man is a jerk. I have a story to share with you. . .but be warned. It is a sad tale. A tale of betrayal, of rejection, a tale of ice cream and a tale of tears. . .
My story takes place on a balmy evening in early-July. Father was out of the home, and The Puff and I were left to our female devices. We were making every moment count. There was giggling, splashing in buckets, and sidewalk chalk murals . . . It was a happy day. A friendly day. . .the kind of day that covers childhood memories of summer in a warm and golden glow. She, adorably flushed and smiling, was the very picture of rosy-cheeked and girlish perfection. There was only one thing that could bring an evening like this one closer to nirvana, and then it happened. . .the ice-cream man came! His winsome chimes repeatedly belted out an all too familiar rendition of ‘Do Your Ears Hang Low?’ as he turned onto our street, and our faces lit up with rapture at the promise of the deliciously cool sweetness soon to come. I, as The Mother, waved to him as he drew near – signaling to him with finger uplifted that he could pause at our house. A smile and a wave from him to me voiced his consent. I dashed into the house, child safely balanced on my hip, to retrieve dollars that were stashed just inside the door for just such an event. A heartbeat later, with payment for our summertime treat grasped triumphantly in sweaty hands, we were back outside. . . .Only to find to our crushing dismay that the truck hadn’t stopped at all. Presuming that he was headed for a conveniently shady spot just ahead to do business, we ran breathlessly after. The sound of his music-box trailed out behind him, drawing us on as he passed house after house. A child three houses ahead joined us in our chase. Shouting and flailing her arms wildly about, she ran as only a kid drawn on by the promise of sugar can. Reassured by our new-found forerunner, I slowed in my pursuit. . .just in time to watch in stunned consternation as the ice-cream truck turned the corner and drove out of site. “The ice-cream man went away! He doan’ wanna share some wif’ me? That isn’t very nice . . .
She said it so sadly, her soft voice forlorn and small. My heart shattered into so many pieces at the sound of it. The promise of popsicles brought the smile back to her lips, and so we headed back. But she didn’t forget. I’m afraid she may have been scarred for life by the events that took place on that tragic evening. To this day she tells the tale, every time she hears those chimes rolling closer. 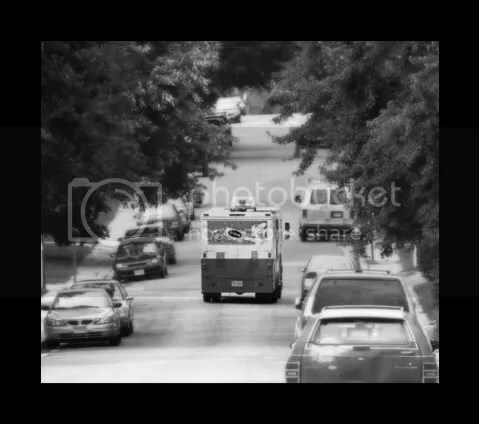 The sad story of the ice-cream man that went away. . .
And did you know that July was national ice-cream month? How sad! Poor girl–yes, he is a jerk! He was probably headed somewhere he thought he could make more profit–he needs to be stripped of his duities! You are a great writer–love it! wow, what a jerk! I wanted to cry for your lack of ice cream, I can’t believe he’d just keep going. Our ice cream man doesn’t come often, but when he does it’s usually around 9pm or so. Oh! How horribly devastating!! I am so very sad that he went away, but so very happy that you, as a mom, had the needed popsicles to make life all better for the little T-one! 🙂 We also have an icecream woman, but unfortunately not only does said ice cream person have creepy music, but also comes around at 9pm as my children as sleeping(hopefully) peacefully in their beds. So very sad that you had such an awful ice-cream man. We sadly don’t get ice cream trucks at our house. We too have the freezie pops for moments when something sweet and cold is needed. Your ice cream story is horrible–we have had the opposite in the past, where the guys slows down and pauses and waits and doesn’t take a hint that we aren’t buying tonight. Your poor girl…sounds like she took it personally! Way to go with the back up popsicles! Ice cream is proof that heaven exists. My personal favorite is Ben and Jerry’s Peach Cobbler, but all ice cream is good. And when you say, “left to our female devices”, what exactly do you mean? I can’t tell you that! Its top-secret girlish information!!! . . .but thanks for stopping by, and I tend to lean toward Ben and Jerry’s Chocolate Fudge Brownie. It is my opinion that CHOCOLATE, not necessarily ice cream, is proof of heaven! WHAT? That effing ice cream man should be tarred and feathered right before an acid bath!!! How dare he dangle promises of utopia to Puff and vanish without a trace!! I say the next time he comes, be waiting with an ambush.